The Pink & Blue Project is an engaging portrait series by South Korean photographer JeongMee Yoon, in which she explores the impact of color choices (pink vs. blue) in connection with gender roles. 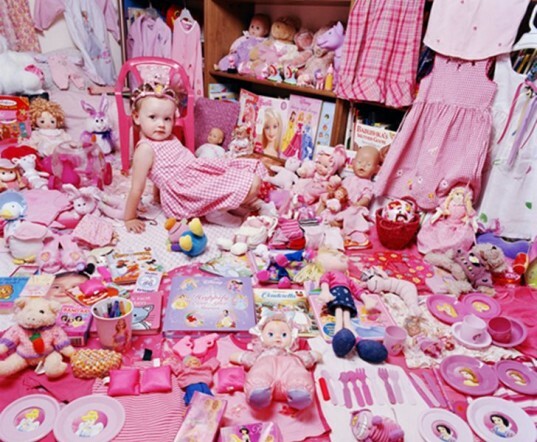 Though clearly there are children all over the world who have preferences for many colors beyond pink or blue, this series provides an eye-opening look at how some kids' lives may be overwhelmed by very specific toy color preferences set forth by the modern-day underlying standard that pink is for girls and blue is for boys. 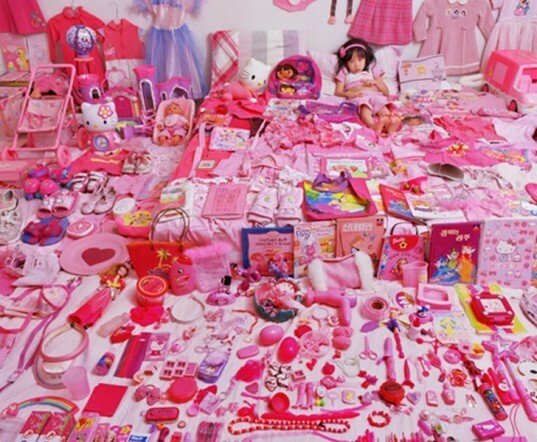 Yoon looks much deeper than the surface of each shade to examine what pink and blue really mean in the realm of a child's toys and belongings. One of the most fascinating parts of the essay that accompanies this series is that Yoon discusses the history of color choices. According to Yoon’s research, pink for girls and blue for boys is a rather new phenomenon. In fact, Yoon found out that pink was once associated with masculinity, due to it being a watered down shade of red, a color once associated with power. Yoon writes, “In 1914, The Sunday Sentinel, an American newspaper, advised mothers to use pink for the boy and blue for the girl, if you are a follower of convention.” The shift to pink for girls and blue for boys occurred after World War II and kicked off in America. Does Pink Equal Domestic and Blue Equal Science? Does Background Affect Color Choice? While exploring children and all their many objects for this project, Yoon found that ethnic groups and/or cultural backgrounds did not present a great divide when it came to gender and color. No matter where children live or how they are raised, kids all over the world are drawn to the same color scheme—pink for girls, blue for boys. Yoon did find that as boys got older they stuck with the same old blue while girls begin to sway towards purple objects around 3rd or 4th grade. Is Pink Bad and Blue A-ok? 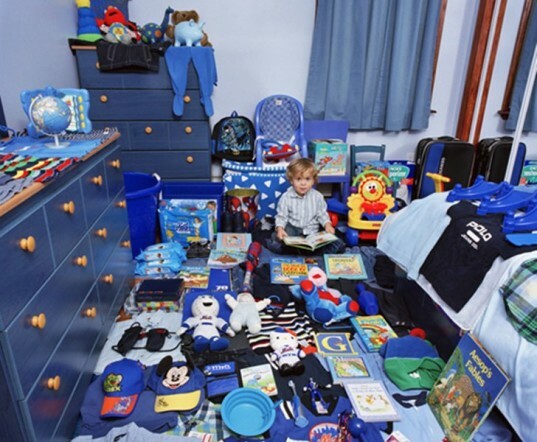 The essay that goes with this photograph series is an interesting read, but does seem overly focused on what many concerned parents seem to believe – that pink is bad for girls, but blue, well, blue is not so bad for boys. For example the essay notes, that pink may be prevalent due to the, “influence of pervasive commercial advertisements aimed at little girls and their parents, such as the universally popular Barbie and Hello Kitty merchandise that has developed into a modern trend. Girls train subconsciously and unconsciously to wear the color pink in order to look feminine.” There’s no mention of what blue obsessions may be based on or how the blue trend may be bad for boys. Not unlike other essays and articles surrounding the theme of color and gender, this essay also points out repeatedly: pink = bad; blue = not so bad. Colors and their relationship to gender roles is controversial. Many people frown on pink girly toys noting that they may be harmful for young girls, while others (like myself) disagree because frankly, there are many issues that shape kids such as parenting styles, peer influence and more. The colors of a child’s toys and belongings are just one small aspect of childhood. Plus, for what it’s worth, I was into pink as a young girl and still like pink goodies now, and I feel that I’m independent, level-headed and smart, which leads me to believe that pink dresses and Barbie dolls didn’t influence me in a negative way. However, as Yoon notes, and as seen in her striking images, color influence is still an important topic and may in some ways, shape a society. What do you think? Can color choices shape an entire generation of kids or society as a whole? Let us know in the comments. I agree with Yoon - the problem is that males and females are being restricted to artificial gender roles from birth, by having the toys color-coded, and every single activity and social trait in their lives gender-coded for them. Girls are supposed to be social, domestic, quiet, and artistic. Boys are supposed to be active and aggressive, and into science, technology, and engineering. These things are NOT natural traits of gender. All individual people are different, and children should be free to express all of their differences and preferences without every being told that they're behaving 'like a boy' or 'like a girl.' So, is there anything wrong with pink? No, so long as boys are equally accepted when they wear it. Most people do not realize that in the 19th century pink was considered a masculine color. It was seen as diluted red. 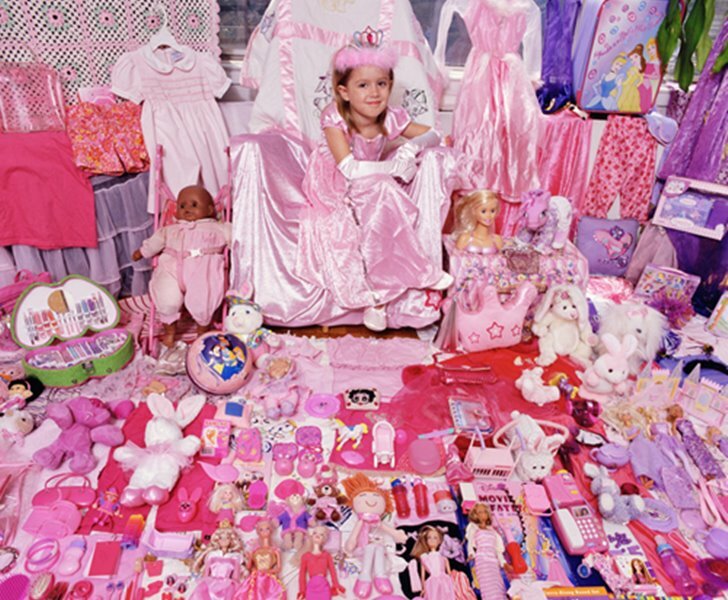 JeongMee Yoon Explores the Relationship Between Color Choices and Gender Roles in Her "Pink & Blue Project"
The Pink and Blue Project was inspired by Yoon's then five year-old daughter, who was utterly obsessed with the color pink. 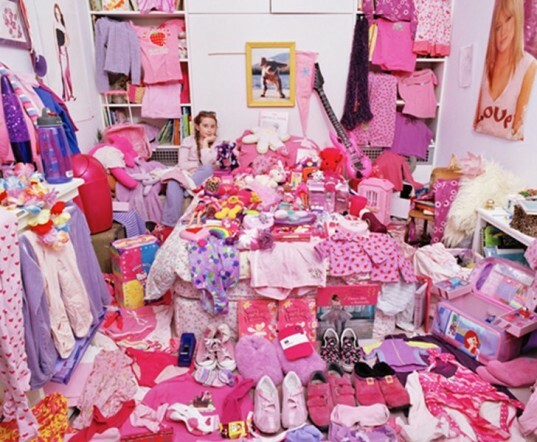 Yoon notes that her little girl loves pink so much that, "she wanted to wear only pink clothes and play with only pink toys and objects." After meeting other parents, Yoon found that her experience was not unusual. In the United States, South Korea and elsewhere, Yoon says she noticed that, "most young girls love pink clothing, accessories and toys," adding, "This phenomenon is widespread among children of various ethnic groups regardless of their cultural backgrounds." After compiling many pink images, Yoon became aware that boys also had a major color preference: blue. Yoon states, "In the case of my eleven year-old son, even though he does not seem to particularly like the color blue over other colors, whenever we shop for his clothes, the clothes he chooses are from the many-hued blue selection." One of the most fascinating parts of the essay that accompanies this series is that Yoon discusses the history of color choices. According to Yoon's research, pink for girls and blue for boys is a rather new phenomenon. In fact, Yoon found out that pink was once associated with masculinity, due to it being a watered down shade of red, a color once associated with power. Yoon writes, "In 1914, The Sunday Sentinel, an American newspaper, advised mothers to use pink for the boy and blue for the girl, if you are a follower of convention." The shift to pink for girls and blue for boys occurred after World War II and kicked off in America. Yoon is of the opinion that not only are girl and boy toys divided by color, but also by theme. For example, Yoon notes that many pink, red and purple girl toys relate to make up, dress up, cooking, and domestic affairs while most toys and books for boys are various shades of blue and relate to robots, industry, science and dinosaurs. In Yoon's opinion, these divided guidelines for girls and boys, "deeply affect children’s gender group identification and social learning." The essay that goes with this photograph series is an interesting read, but does seem overly focused on what many concerned parents seem to believe - that pink is bad for girls, but blue, well, blue is not so bad for boys. For example the essay notes, that pink may be prevalent due to the, "influence of pervasive commercial advertisements aimed at little girls and their parents, such as the universally popular Barbie and Hello Kitty merchandise that has developed into a modern trend. Girls train subconsciously and unconsciously to wear the color pink in order to look feminine." 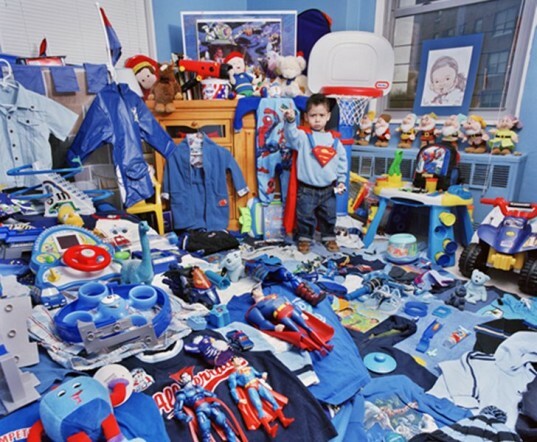 There's no mention of what blue obsessions may be based on or how the blue trend may be bad for boys. Not unlike other essays and articles surrounding the theme of color and gender, this essay also points out repeatedly: pink = bad; blue = not so bad. Colors and their relationship to gender roles is controversial. Many people frown on pink girly toys noting that they may be harmful for young girls, while others (like myself) disagree because frankly, there are many issues that shape kids such as parenting styles, peer influence and more. The colors of a child's toys and belongings are just one small aspect of childhood. Plus, for what it's worth, I was into pink as a young girl and still like pink goodies now, and I feel that I'm independent, level-headed and smart, which leads me to believe that pink dresses and Barbie dolls didn't influence me in a negative way. However, as Yoon notes, and as seen in her striking images, color influence is still an important topic and may in some ways, shape a society. What do you think? Can color choices shape an entire generation of kids or society as a whole? Let us know in the comments.